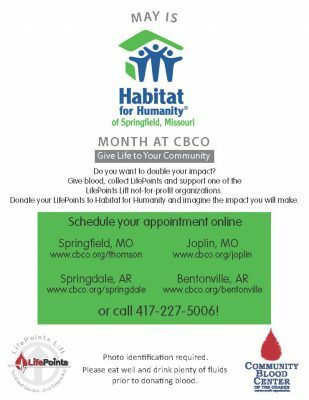 May 2018 is Habitat For Humanity month at Community Blood Center of the Ozarks! It’s a great way to help two non-profits at the same time — CBCO with your lifesaving gift of blood and Habitat For Humanity with your LifePoints which allows the organization to work toward its mission to help homeowners achieve strength, stability and self-reliance through shelter. You’ll receive LifePoints for your donations all year round, and you can give your LifePoints to one of our agency partners at any time. Not just in May. But May is our time to share information about Habitat For Humanity. Habitat For Humanity believes every person in Springfield and the surrounding area deserves a safe and affordable place to live. As an affiliate of Habitat for Humanity International, they have an impact on more than 110 households a year. Since 1988, they have either built or renovated more than 570 homes, providing shelter for more than 1,100 men, women, and children from Greene, Christian, and Webster Counties. Habitat For Humanity – Springfield helps people gain strength, stability and independence through housing, including home construction, rehabilitation, and repairs, and by increasing access to improved shelter through products and programs. They are a United Way of the Ozarks partner agency. To learn more about Habitat For Humanity, click HERE. Founded in 1995, CBCO has grown to serve 39 counties in three states and is the sole supplier of blood and blood products to 41 hospitals in southwest Missouri, northwest Arkansas, and southeast Kansas (as of 5/1/18).